Every weekend, we give our Day Campers an opportunity to try our Resident Camp. For our new “TGIS,” the drop-off will be on Saturday at 4pm. From there, your camper will get to participate in a camp activity, have dinner in the cafeteria, partake in a special evening activity, have a campfire with songs and s’mores and then have an overnight in one of our dorms. TGIS campers eat breakfast at camp the next morning and pick-up starts at 10:15am. TGIS is a great way for Day Campers to experience the fun of Resident Camp! Cubs entering 1st grade are eligible for TGIS. Sign your camper up for semi-private swimming lessons with one of our certified lifeguards. Lessons are individually tailored to meet the needs of each child. These lessons are more geared toward new or beginner swimmers. Swimming lessons are taught daily after camp is over. Space is limited so sign-up early if you are interested. Swimming lessons are offered for an additional $250/week. Please click on the “MyWoodside Login” link to access the swimming lesson form. Swimming lessons take place at the end of the camp day and start around 5pm. For Cub Campers, swim lessons happen at the end of their day, from 3:45-4:15. 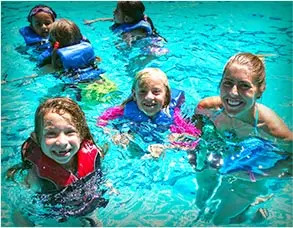 All cancellations must be received two (2) weeks prior to your camper’s swimming lesson in order to receive a refund. No refunds for swimming lesson cancellations with less than two weeks notice. 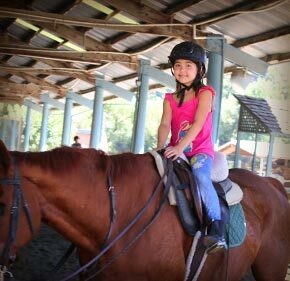 Mountain Camp Woodside is fortunate to be close to some of the most premier horseback riding facilities in the Bay Area. Campers who enroll in our horseback riding lessons will spend an hour each day at the Spring Down Equestrian Center. Our campers will receive both a ½ hour horsemanship lesson and a ½ hour riding lesson. The equestrian center has highly qualified instructors and many beautiful show-quality horses. Please visit “MyWoodside Login” link to access the horseback riding form. All cancellations must be received two (2) weeks prior to your camper’s horseback riding lesson in order to receive a refund. No refunds for horseback riding cancellations with less than two weeks notice. Mountain Camp Woodside offers a Counselor in Training (CIT) program that is available for both Day and Overnight campers entering 9-12th grade. The program emphasizes leadership skills, creativity, team building and most importantly fun! 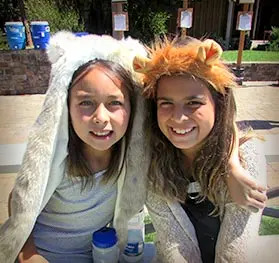 By acting as role models for younger campers and assisting in leading different aspects of the camp program, it is our goal that the CIT’s walk away having learned new leadership skills and have formed lasting memories with our youngest campers. CIT’s will have regular meetings and will plan and lead campers in a variety of camp activities that they have chosen. They will also create their own activity for Wacky Wednesday. Day camp CIT’s will also be able to participate in mid-week Evening Program, special for CITs. CIT’s will be given shirts to wear so other campers and staff members can identify them as CIT’s. There is a short application that must be completed by the applicant in order to be considered for this program. After you have enrolled your camper for the CIT program you will receive an email directing you to the CIT application within your Mountain Camp Woodside account. When choosing CIT candidates, past performance, the application and counselor references will be taken into account. If you would like more information about the Counselor in Training program, please do not hesitate to contact our office. Session One – Mis-Match Day. You CAN wear stripes and plaid. Session Seven – Camper Group Color Day – The specific color will be determined by the groups at camp this week. Ben had a great time! - Carey D.